One of the most important things I learned in Italy was to cook with less oil and finish with raw oil instead. This is an easy recipe, but probably one of my favorites from the trip. I have made this multiple times already in the last month. I usually don’t use mint unless it is for a dessert, but this combination of citrus and mint is so unique and tasty. You don’t need to add and oil while grilling the zucchini, which makes it even healthier. Also, the longer you let the grilled zucchini marinate, the stronger the flavors. 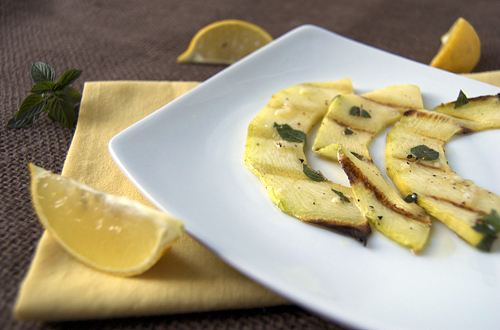 Turn grill to medium-high and slice zucchini. Grill zucchini until soft with nice grill marks (about 5-10 minutes per side). While zucchini is cooking, combine remaining ingredients in a bowl and let flavors combine. Toss cooked zucchini in with the olive oil mixture and let marinate before serving (10 minutes up to overnight if refrigerated). I love how you mention finishing with raw oil, so perfect and fresher than loading up with saute oil, These look simple but still really fancy.. I like the simple ingredients you used here to flavor up the grilled zucchini. 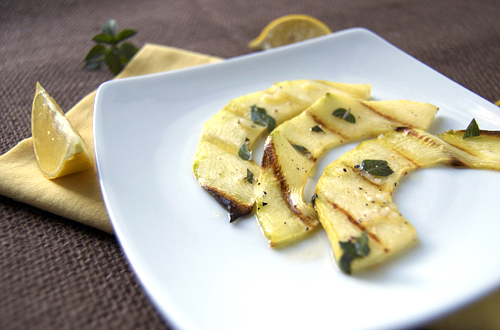 I will need to try this lemon mint combo-and who doesn’t like grilled zucchini-yum! this looks so simple and elegant! Love it. healthy and delicious! This looks awesome. I’ll keep that tip about oil in mind. Thanks! What’s more amazing is that you’ve been to Africa and Italy in the past six months and are headed to Hawaii. Like Aunt Lynn says, it’s good to be Jenny! That looks amazing! I always loved it – when we lived in Italy – their deft hand with olive oil. I just loved it! Yes it does make sense! haha thank you! This looks amazing. I am so trying this like…tonight! That would make a great side dish.